By Xerox standards, this is a modest machine, but it has the specifications and features to suit almost any small to medium business. The print speed is only average, but the consistent quality of it colour and mono prints is impressive. So too is the intuitive touchscreen interface that gives you easy access to a wealth of features such as dual-sided scanning and a broad selection of security features. This feels like a premium product and it’s well supported by modular upgrades. Given its ability to print on A3 paper, this is a surprisingly compact multifunction device, that will happily share a desk with your PC. It prints clearly in monochrome, while colour photos look quite vibrant on photo paper. The touchscreen is rather small and it’s not the fastest duplex printer around, but it hits a near perfect balance balance between quality, performance and features. The compact, lozenge-shaped design belies this MFD’s surprising ability to print on A3 paper. Without taking up much space in your home office, it can turn out superb quality documents and make high-resolution scans. There’s no document feeder or fax facility, but Epson’s six-ink system more than compensates by printing remarkably accurate photos on photo paper. Canon has managed to shrink all of the features a small business might need into a multifunction device that could fit inside a filing cabinet. The five-ink system gives great quality photo prints and the large touchscreen makes it especially easy to use. 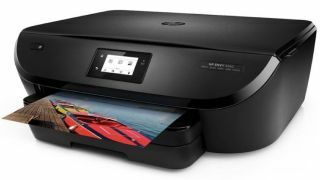 The print speed is a little slow, even for an inkjet, but it is well featured with both Bluetooth and Wi-fi connectivity and a handy SD-Card slot at the front. What looks like a oversized breadbin is actually a highly efficient and reliable colour laser printer. You can fit 500 sheets in the deep main paper tray and with Kyocera’s high capacity toner cartridges installed, the cost per page works out favourably. The interface is cramped and difficult to see, but it prints very quickly and quite quietly too. This heavy lump of a laser printer is distinguished by a seven-inch touchscreen that makes it very easy and secure to call down print jobs when your standing at the machine. It prints very quickly in duplex mode in either colour or mono, while its high capacity toner cartridges ensure a competitive per page cost. Wi-Fi is not built in, but for hardwired workgroups in a busy office, this machine would serve well. Epson’s second generation of EcoTank printers refines its refillable ink system and is deployed here by a highly capable inkjet MDF. Photo quality is excellent and the ability to print on A3 paper is a real boon. The interface lacks a touchscreen and printing is slow, but the pages are well worth waiting for. If the price tag appears prohibitive, that’s because there are two sets of ink bottles in the box. Enough to print 3,600 photos! It might look a little top heavy, but this all-in-one A4 printer feels well made and offers plenty of features for the footprint that it takes up. Duplex scanning from the ADF and rapid automatic photocopying are performed flawlessly, while the print quality in both colour and mono is excellent. Duplex printing is not the fastest, but a wealth of security features and an easy interface more than makes up for the shortfall. Kodak’s entry-level printer cannot compete with more expensive models when it comes to print speed, or outright quality, but for value, design and ease of use, it excels. Kodak’s replacement cartridges are more affordable than most inkjets and the interface is especially user-friendly. The ingeniously compact design makes it hard to begrudge a multifunction device with a footprint that’s little bigger than a sheet of A4.